If you’re ready to sell your Roatan real estate, I’m ready to help you get the best price for your property. Take a look through my website and social media channels. You’ll quickly see the emphasis I put on marketing. I’m the most active real estate agent on social media in Roatan and you’ll also see my site showing up on Page 1 for Google searches of Roatan real estate. I focus on marketing your property because that is what sells. Yes, Roatan is a desirable paradise. Yes, buyers are looking at their options regularly. Yes, the Roatan MLS is an incredibly helpful system in getting your property noticed. But, no, putting up a “For Sale” sign is not enough. I believe in accurately assessing your property to price it appropriately. Setting a realistic and attractive price starts us off on the right foot. And then pushing your property out to be in front of potential buyers is of utmost importance. I consistently work to maintain my presence online, which allows me to introduce your property to my extensive networks right away. 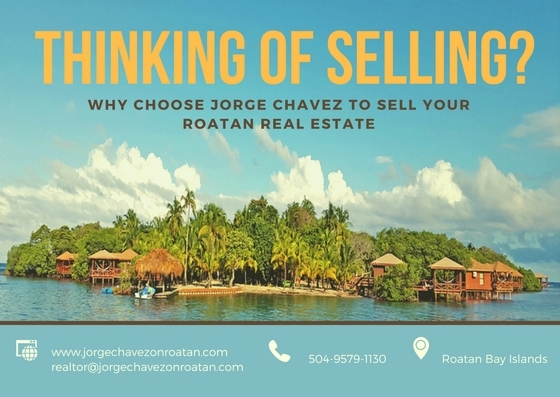 When you’re ready to sell your Roatan real estate, the last thing you want is a prolonged process filled with frustration. I believe in honesty and open communication. I’m not going to sugarcoat anything for you, nor will I just say anything to get a listing. Your property isn’t just another listing in my book. I’m here to provide complete, professional support for people who choose to entrust their property sale to me. Your investment matters. Let’s work together to make sure you’re happy with the sale of your Roatan property. Contact me and let’s get your property seen by the right people. • Jorge Chavez handled what became a complicated house sale transaction for me after having the house listed through the worldwide economic downturn. A number of times he could have requested assistance or asked for additional compensation for his efforts solving problems and seeing that the solution were properly carried out. There was a last minute change in the way the transaction had to be completed which was carried out under Jorge’s direction with minimal requirement from me. At all times he looked after business as required. In summary, Jorge completed the entire transaction and details involved in the most professional manner. I would highly recommend Jorge to any buyer or seller involved in a residential house transaction. Yours very truly, Vic Walls.